From the Border Fine Arts World of Beatrix Potter Money Banks range. Height: 17cm. 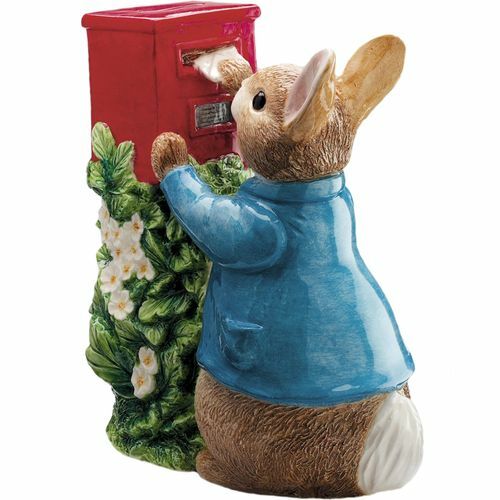 A charming Beatrix Potter Peter Rabbit Money box, showing Peter posting a letter. This piece is one of a number of excellent Beatrix Potter money banks in a collection, which has particular appeal because of the vibrant primary colouring, plus the acclaim of the character and attention to detail. It would also make a pleasant nursery ornament for a child, especially as an introduction to the classic Beatrix Potter works. To view more exciting products from the World of Beatrix Potter Money Bank range, please visit the Money Banks page via the main menu.